NVIDIA released JetPack 3.1, the production software release for the Jetson TX1/TX2 platforms for AI at the edge. JetPack 3.1 doubles the deep learning inference performance for low latency applications for batch size 1. For the first time, developers will have access to the same unified code base for both TX1 and TX2, including a shared Linux kernel 4.4 codeline, libraries and APIs. This comprehensive package gives developers advanced tools to create tomorrow’s robots and intelligent machines. 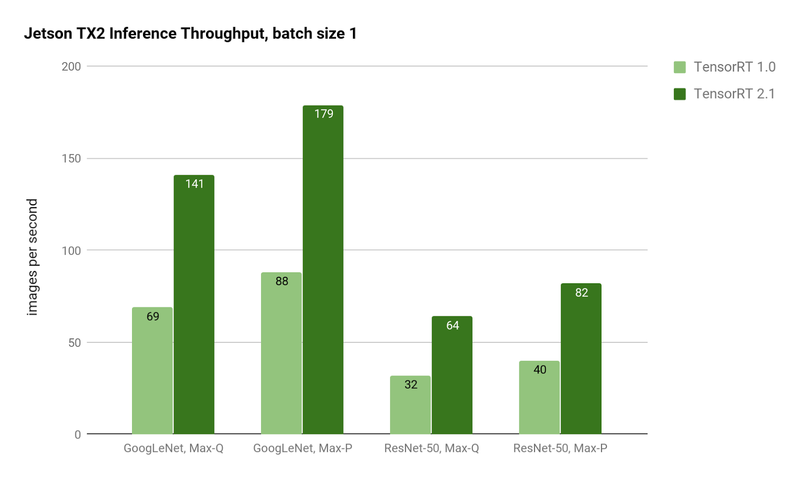 Figure 1: Inference throughput of GoogLeNet and ResNet-50 using Jetson TX2 Max-Q and Max-P power profiles. TensorRT 2.1 provides twice the inference throughput on GoogLeNet and ResNet. Dive into deep learning with NVIDIA’s guide to building a demo in two days. All the necessary tools are provided, including quick start guides, software samples and pre-trained network models. Listen to NVIDIA’s on-demand Webinar on “Breaking New Frontiers in Robotics and Edge Computing with AI.” It covers the latest tools and techniques to develop autonomous robots and other intelligent machines with NVIDIA Jetson TX2. Learn more about what NVIDIA is doing for the future of robotics with the Isaac Initiative, including the NVIDIA Jetson Reference Platforms and Isaac Lab.